Owned and operated by Ed Shevenell and Kari Williams, Snappy’s Tube Steaks stands out in its appearance, too. The cart is a 1961 Cushman Truckster with a hot dog vending unit mounted on it. Ed has never been one to settle for standard when unconventional is possible, and Kari has long recognized the value of a strong brand, which Snappy’s is focused on building. But the real highlight is all about the flavor. Drawing on their years of experience in the culinary industry, including time at some of Maine’s most renowned resort destinations such as Sugarloaf, Migis Lodge, and the Black Point Inn, Ed and Kari have created clever topping combinations that take your standard red snapper or all beef hot dog and deliver an entirely new and unique experience. I’ve never had a hot dog quite like these. 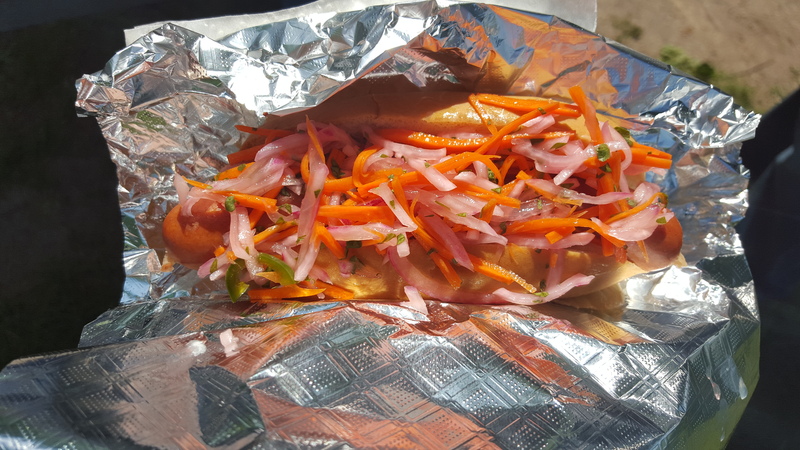 Take the “Don’t You Forget a Banh Mi” dog, for example – my choice largely for the addition of jalapenos – which features a special Banh Mi slaw, hoison mayo, and lime juice. I honestly could have eaten the topping all by itself – it was that good. In combination with the Pearl casing all beef hot dog, a smooth base for the tart and tangy flavors of the slaw, it was truly outstanding. Similarly, many people love the Salty Dog, which features savory sauerkraut, and the just launched ‘Born to Brie Wild,’ which I plan to try as soon as possible. Snappy’s offers the Pearl casing, all beef hot dog I mentioned as well as the classically, fantastically Maine red hot dog. Frankly, if you’re Maine-raised like me, you probably have fond memories of biting into many a red snapper at family cookouts, at fairs and festivals, and for dinner when Mom was away and Dad manned the grill. A red snapper from the aptly-named Snappy’s will deliver a wave of flavorful nostalgia for you. Stay tuned for a forthcoming blog post all about the history of the red hot dog. It’s fascinating and not to be missed. 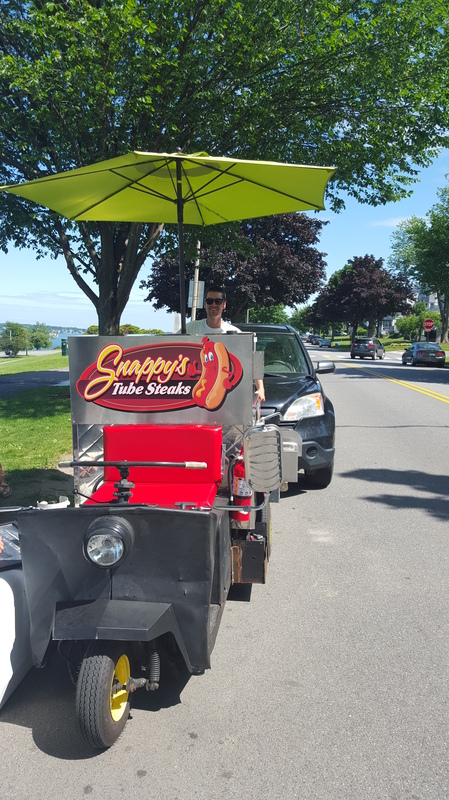 Most days, Ed, Kari, and the Snappy’s Tube Steaks truckster can be found on the Eastern Promenade in Portland from approximately 11am – 5pm. In addition to a stunning ocean view, this spot offers open space, a playground, and picnic tables, making Snappy’s a perfect lunch out with the kiddos. Picture perfect setting for a classic hot dog delight! In addition to the daily gig, Snappy’s is available for special events and can often be found at a craft brewery or festival over the weekend days. Keep your eyes peeled for your opportunity to experience tube steaks like never before! Find them on Facebook or follow them @snappysmaine on twitter! Categories: Eat, Shop | Tags: food cart, hot dog cart, hot dogs, Maine, Portland, Snappy's, Snappy's Tube Steaks | Permalink.